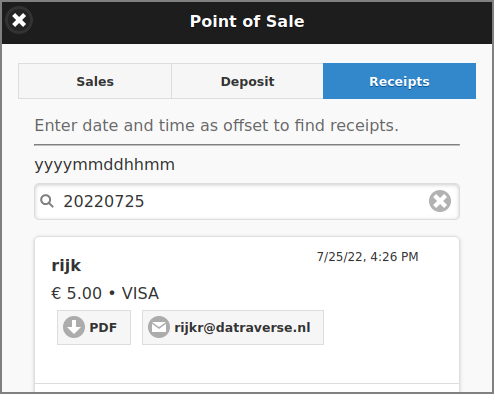 The Receipts tab is the place to query deposit history. The figure below shows a content sample. By entering a date/time offset in the prescribed yyyymmddhhmm format, a pick-list of matching receipts is displayed, sorted in descending date/time order. The list is refreshed real-time as characters are entered (or deleted). Note: the date/time defaults to the current yyyymmdd date (today). Each entry in the list has buttons to download the Receipt PDF or email it to the User (again).